In 1937, Baine Isaacson brought his young bride, Esther, to El Chorro Ranch, a tract of hills and oaks on Highway 1 just outside of Lompoc that was once part of the original Rancho San Julian land grant. 75 years later, El Chorro remains a working cattle ranch, and Esther Isaacson has just celebrated her 100th birthday, a steadfast presence in these sometimes-wobbly times. She is as rooted here as the California oaks and says that she never wants to be anywhere else. 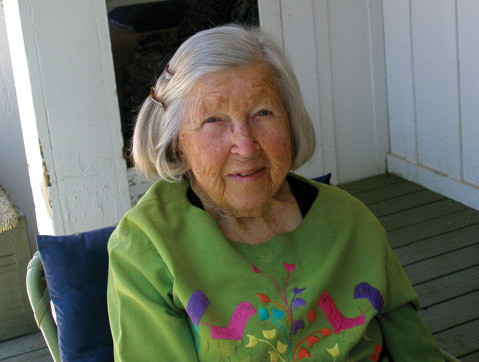 Esther had been a teacher in Solvang and the daughter of one of the town’s original Danish settlers. “They were pioneers who came from Denmark to build a colony,” she explained. “My father, Anton Ibsen, was a carpenter, and he came there in 1910 to build the college. When he first arrived, it was all men. If you were to be married, you had to build a house for your wife before you married her. My father was so busy that he asked my mother not to come right away, but she didn’t get the letter in time. She came down by railroad from Seattle to San Luis Obispo, wearing a beige suit and carrying a little white dog and a potted plant, and that’s all she really had. Of course, he wasn’t there to meet her when she arrived. She finally got someone to lock her in the baggage room for the night. Esther attended Atterdag College, which no longer exists. (“I can’t even prove I’ve been educated,” she joked.) She loved being a teacher and living in town. For fun, young people went square dancing or got together for volleyball, badminton, and tennis, and it was at one of these social events that she happened to meet Baine. “I was never going to be a rancher’s wife,” she said. “That would be the living end!” But love derailed her, as love sometimes does, and she gamely set out for her new life in the country, learning as she went along. During the war, the house was darkened at night with drawn shades and blackout curtains. In the 1950s, when Vandenberg started launching missiles, there were strange explosions in the sky, exciting to the kids. “We raised an awful lot of children here, not just our own three sons,” said Esther, recalling treasure hunts, kite flying, and even a miniature steam railroad. Esther expressed pride in her family and in the fact that El Chorro remains a working cattle ranch, recalling how Baine’s long-ago vision and community involvement helped preserve the area for agriculture and keep it free of billboards and development. Today El Chorro is permanently protected by an agricultural easement. Remembering how our Gaviota Writers’ Group used to meet here by a great old oak on a hilltop meadow, I asked Esther if she had a particular favorite spot on the ranch. She looked momentarily baffled by the question.